The state government has submitted another ambitious Rs 600-crore project to the Union Ministry of Water Resources for channelising 73 tributaries of the Swan river in Una district. There will be no respite from the intense cold wave conditions prevailing in the state as the situation can worsen during the next four days. After a few sunny days, the Kangra valley again shivered as the sky was overcast with clouds and cold winds virtually penetrated the bones forcing people to be indoors despite the festival of Makar Sankrati today. Pilgrims who thronged this temple town were the worst sufferers. The district police has confiscated about 56,000 ml of illicit liquor that was produced in Indora and Nurpur subdivisions of Kangra district and was meant to be smuggled into Punjab. The high-level team, constituted by the Congress to look into reasons for defeat in the byelection in its traditional stronghold of Renuka, will interact with party functionaries and workers to ascertain the shortcomings that led to the debacle. With the PWD being marred by labour crunch, the Department of Rural Development has decided to “clear and maintain all link roads under the PWD both in tribal and non-tribal districts by using the Mahatma Gandhi National Rural Employment Guarantee Act (MNREGA) programme funds” to ensure an all-weather road connectivity in rural areas. 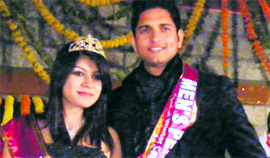 Ishani Jaswal of Mandi was crowned Winter Queen at the national-level Winter Carnival-2012, which concluded at the Manu Rangshala here late last night. Neha Das of Assam was the first runner-up and Vinee Ghazta of Shimla the second runner-up. Chief Minister Prem Kumar Dhumal will embark on the annual winter sojourn of Kangra and nearby districts from tomorrow. With the issue pertaining to the transportation of back load in JP Cements failing to be resolved, truckers’ strike has entered the 14th day at Bagha in Darlaghat. Since the management of JP Cements had earlier agreed to grant back load on the analogy of Ambuja Cements Ltd from January this year, the failure to implement this agreement has invited the ire of truckers. Taking a strict note of the manner in which registration of 45.1 bighas purchased by the Himachal Pradesh Housing and Urban Development Authority (HIMUDA), near Dharampur, had been executed at Parwanoo in the camp office of naib tehsildar violating the norms, the CM office has issued directions to fix accountability for this action, besides enquiring into the aspect relating to purchase of the land at Rs 11 lakh per bigha, which appeared to be an exorbitant proposition given the location of the land. With the Union Government releasing Rs 11 crore in lieu of transport subsidy due for the state’s industries since 2006, investors will finally get the much-awaited relief. The Palampur Welfare Forum and the Dhauladhar Seva Samiti in their meetings held here recently demanded district status for Palampur without any further delay. In a case collision, Anuj Tirki (27), a labourer from Jharkhand, was crushed to death after he jumped out of a truck (HP 65 5856). The Bench of Consumer Forum while camping here has directed the Secretary, Co-operative Multipurpose Society Ltd, Chambi, Sundernagar, to refund an amount of Rs 3,400, along with interest @ 9 per cent from the date of deposit till it was realised, along with Rs 1,500 as compensation plus Rs 1,500 as the cost of complaint to Sant Ram of Chambi of Sundernagar subdivision. Renowned historian of Chamba Amar Singh Ranpatia died on January 10 at his native village Gum in Chamba district. He was 82. Burglars broke into the house of Krishan Chand of Kalwari under Banjar police station and decamped with jewellery worth Rs 1 lakh and other goods worth Rs 60,000 on the intervening night of January 12 and 13. To help various hospitals in the town tide over the acute shortage of blood, Umang Foundation today organised a blood donation camp on the Ridge. Sources here told The Tribune that the state had proposed in the said project that about 7,000 hectare agriculture land could be reclaimed if all the 73 tributaries of the Swan would be channelised. Minister for Irrigation and Public Health (IPH) Ravinder Ravi said the project was likely to be passed by the Union Ministry of Water Resources soon. Principally, the ministry has accepted the proposal of the state to channelise all the tributaries of the Swan. The Swan was once known as “the sorrow of Una district” as almost every year during the monsoon season, flash floods in the river used to wash away large tracks of agriculture land. Due to flash floods in the river, farmers had stopped cultivating large tracks of their land located near its banks. The Swan that is a tributary of the Sutlej has its origin in the Shivalik hills, near the Talwara area of Punjab. It travels through Una district and finally merges with the Sutlej near the Anandpur Sahib area of Punjab. However, now the major portion of the Swan in Una district has been channelised. An amount of over Rs 300 crore had been spent on channelisation of the Swan canal in Una. The project to channelise the Swan is now nearing completion. About 10,000 hectares of agriculture land has been already reclaimed due to channelisation of the Swan river in Una district till date. Now, the IPH Department has submitted another ambitious project to the Union Ministry to channelise all the 73 tributaries of the Swan canal. The tributaries of the Swan are spread across the Una district and generally receive water only during the monsoon season. Most of the tributaries beds are owned by private owners. However, the department might face some problems in the channelisation of the tributaries of the Swan in case the project gets through from the Centre. The beds of the tributaries, especially near the urban areas of Una district, have already been encroached upon. At many places unauthorised colonies have come up in the river beds of these tributaries. Now, these illegal structures might prove to be a bottleneck for the irrigation authorities in channelising these rivulets. Environmentalists are also expressing concern regarding loss to the flora and fauna of the area in case all the tributaries of the Swan are channelised. The tributaries of the Swan at places have natural wetlands that are habitat to many endangered species of animals, birds and reptiles. The wildlife of these wetlands may lose habitat in case all the tributaries of the Swan are channelised, they maintain. Due to the channelisation of the Swan river already, Sarus crane, an indigenous bird variety that is registered as an endangered bird variety in the Red Data Book of the International Union for Conservation of Nature, has already lost its breeding grounds in the wetlands of the Swan in Una. The Meteorological Department today issued alert of heavy rain, snow and hailstorm in most of the parts of the state in the next 48 hours. With life in the higher reaches of the state yet to return to normality after last week’s snowfall, the earning by the Meteorological Department has put the government on alert as there is a forecast of heavy-to-very-heavy snowfall. The Chief Secretary has already directed the administration of Kinnuar, Lahaul-Spiti, Kullu, Chamba, Shimla and Sirmaur districts that are likely to have heavy snowfall to make preparations in advance so that people do not face inconvenience. After a brief sunshine this morning, the weather in the state capital seemed to be getting bad, as the sky remained overcast. “Heavy snowfall is likely to occur in the high hills during the next 48 hours as the western disturbance currently placed over North Pakistan and East Afghanistan will affect Himachal,” warned Manmohan Singh, Director, local Meteorological Centre. He said there would be heavy rain and thundershowers during the next 48 hours from tonight. “Snowfall will occur at most places over the higher reaches, including mid-hills on January 15 and 16,” he warned. The low hills, he added, would experience rain and hailstorm during the next 48 hours. The inclement weather conditions would prevail till January 18. The minimum temperature in Shimla was recorded at 3.2°C, Sundernagar 1.6°C, Bhuntar 0.2°C, Kalpa minus 6°C, Dharamsala 3.1°C, Una 1.2°C, Mandi 2.7°C, Nahana 8.5°C, Keylong minus 12.7°C, Palampur 4°C, Solan minus 0.2°C and Manali minus 4.2°C. It was after almost a week that vehicular traffic to Chopal, Rohru and Jubbal was restored after the road was cleared at Kharapatthar. Traffic to Rampur and Kinnaur is still going via Basantpur even though the road has been cleared. The supply of electricity in some interior parts of Chamba, Shimla and Kinnuar districts has still not been restored. With chances of more snow over the next few days, the situation in these parts is likely to worsen as far as supply of essential services is concerned. After the snowfall that the valley witnessed on January 7 last after 67 years, today was the coldest day. Braving the biting cold, pilgrims from all over the country, who had arrived here in connection with the Makar Sankrati, were seen in long queues to pay obeisance at the Bajjreshwari temple here today. Reports of severe cold wave conditions were received from different areas of the valley which included Nagrota Bagwan, Gaggal, Mallan, Shahpur, Dehra, Jawalamukhi and Ranital. The Dharamsala and McLeodganj too witnessed a cold today. The demand of illicit liquor from Kangra was generated due to the Assembly elections in Punjab that are scheduled on January 30, local sources said. Kangra SP Diljeet Thakur while talking to The Tribune said illicit liquor had been confiscated from the Chani Beli village and Thakur Dwara areas. These areas were located on the border of Punjab and Himachal and were notorious for brewing illegal liquor, he said. He said persons arrested in the case had revealed that they were planning to sell the liquor in the border areas of Punjab and the demand for illicit liquor in Punjab had increased due to the elections. The SP added that 35 drums of illicit liquor had been destroyed in police raids and nine cases had been registered against various persons. Chani Beli village is dominated by the Sansi community that migrated to the area from Gurdaspur district of Punjab. Certain members of the community are notorious for their activities of generating illicit liquor. People have developed an infrastructure for brewing illicit liquor in their houses in the village. The illegal liquor trade has also brought prosperity to the village as most of the houses are pucca. The state in the recent past has provided government jobs to certain residents of the village to dissuade them from the illicit trade. The team, led by former minister Brij Bihari Lal Butail from Kangra, will arrive in Nahan tomorrow to look into reasons of the party’s defeat in Renuka. He, along with two other members, MLA Rajesh Dharmani and former MLA Sohan Lal, will meet party workers at Sangrah in Renuka the next day. The District Congress Committee has informed party workers about the visit of the team so that they can place their views before it. Workers have been told that they can meet committee members at Nahan or Sangrah as per their convenience. The committee will submit its report to the Himachal Pradesh Congress Committee (HPCC) chief after taking leaders’ viewpoint into account. 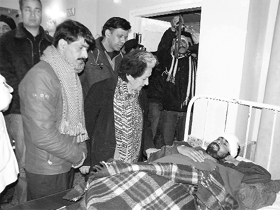 HPCC chief Kaul Singh Thakur had entrusted the task of fact-finding to the committee. With Renuka being considered a Congress bastion, the party was confident of registering a victory, but contrary to its expectations it lost the seat to the ruling party by over 3,500 votes. In fact, Union Minister Virbhadra Singh campaigned extensively in the area seeking sympathy votes for the Congress candidate. Renuka was one of the two Assembly segments, along with Nalagarh in Solan, where byelections were held in November, following the demise of the sitting legislators, Dr Prem Singh and Harinarain Saini. The Renuka seat had been represented by Dr Prem in the Assembly six times. The Congress had fielded Vinay Kumar, son of Dr Prem to take on BJP candidate Hriday Ram, a state services officer who quit his job to start a political innings. The campaigning in the Renuka byelection was high-pitched as the Congress accused the ruling BJP of not only misusing the official machinery, but also distributing money and liquor to influence voters. Money was seized from the BJP office and handed over to the Election Observer (Expenditure) and a huge quantity of liquor was also recovered from the rest house vehicle of a BJP leader. The constitution of the fact-finding committee was being viewed as an attempt to hit out at Virbhadra Singh, who had campaigned extensively in the area. However, the viewpoint of the Block Congress Committee chief, PCC delegate from Renuka and other district leaders would be crucial for determining the cause of the defeat. According to sources, the Department of Rural Development has decided use MNREGA funds not only for clearing roads in snow-bound areas, but also for the maintenance and their upkeep as well during the rainy season. This decision is followed after the PWD was hit by the severe labour crunch. As a result, the PWD has failed to clear the snow on the link roads on time. Most of the link roads in the snow-bound areas of Kullu, Mandi, Shimla, Kangra, Chamba, Kinnaur and Lahaul-Spiti districts have been blocked by the intermittent spells of snow in the first and the second weeks of this month. The link roads in the apple belt are the lifeline as road connectivity is crucial this week as farmers in the snow-bound areas have yet to add fertiliser in apple orchards as HIMFED is yet to procure it from the Centre. Though the PWD claimed that it has opened all major roads in snow-bound districts, the link roads in the higher regions of Seraj, Karsog subdivision and Gara Gushaini in Mandi district and Barshaini-Tosh, Lug valley, Halaan and Dalash-Khanag in Kullu district and Chopal, Jubbal, Rohru in Shimla district and Bara Bhangal and Multhan in Kangra districts are yet to be opened for traffic. In fact, there is a road length of 31,867 km in the state out of which 12,860-km is kachcha and, hence, these roads are prone to landslides during the rainy season. About 6,000-km road length is in snow-bound areas and about 1,950-km road length is in snow-bound tribal districts of Kinnaur and Lahaul-Spiti, said PWD engineers. Rural Development Minister Jai Ram Thakur told The Tribune that all the link roads would be maintained and cleared of snow by using MNREGA funds. “We will provide job cards to the PWD. It will take care of labour shortage and ensure road maintenance,” he added. The minister said there was no shortage of MNREGA funds as this programme was demand-driven. He added that the PWD would use its machineries. The manual work would be done through the MNREGA-card holders through the networks of gram panchayats. Personality contest (men): Varun Sharma - first ; Rajneesh, Mili Juli Group, Assam - second; and Gaurav Verma, Panjabi Sabhya Chark, Nabha - third. Fancy dress: Sutardhar Kala Sangam, Kullu - first; M-3, Manali- second; and Jagriti Kalamanch, Manali - third. Classical dance: Rachana Nritya Vidhalya, Maharashtra - first; Inder Dhanush, Orissa - second; and Sutardhar Kala Sangam, Kullu - third. Group songs: Satya Group of Theatre, Ludhiana - first; MAVNJ, Sundernagar - second; and Sudreshan Kalasangan, Kullu - third. Fashion show: Jagriti Kala Manch, Manali - first; Mili Juli Group, Assam - second; and Sarswati Kalasangam, Jharag - third. Folk dance: Sutardhar Kala Sangam, Kullu - first; International Culture Academy, Ludhiana, second; and Mili Juli Group, Assam - third. Jhanki (carnival parade): Mili Juli Group, Assam - first; Sarsvati Kalamanch, Jharag - second; and Rachana Nritya Vidhalya, Mumbai - third. Street play: Sutardhar Kala Sangam, Kullu- first; Jagriti Kalamanch, Manali-second; and Pratibha Durpan, Jammu -third. “We Are Rock Stars” from Mumbai was adjudged as the best behaving team, while the Mili Juli Group, Assam, was declared the all-round best team. Local MLA Govind Singh Thakur, State Women Commission Chairperson Dhaneshweri Thakur and SDM, Manali, Balbir Thakur were present at the closing ceremony. The MLA honoured the winners and expressed gratitude to all teams and the organising committee for the success of the Winter Carnival. On the first day, the Chief Minister will preside over the function “Prashasan Janta Ke Dwar Par” at Dharamsala. On January 16, he will hold a meeting with the Deputy Commissioners of Chamba and Una at Dharamsala for reviewing developmental activities. The practice of winter sojourn was started by Union Minister Virbhadra Singh when he was Chief Minister with the objective of bringing the government closer to people of Kangra and adjoining areas during the winter months. This provides them an opportunity to get their grievances redressed and problems solved without the trouble of travelling all the way to the state capital. Dhumal on becoming the Chief Minister continued the practice and spends about a fortnight every winter in Kangra, Chamba and Una meeting the public. His presence in the area ensures the attendance of all senior officers and people can get their problems redressed on the spot. Despite several rounds of talks between truckers and the management of JP Cements, where officials of the district administration from Solan and Bilaspur were also present, the issue has remained unresolved. Another round of talks is slated to take place at Darlaghat tomorrow. Rattan Mishra, president, Solan District Transporters’ Truck Cooperative Society, said it was surprising that the state government had failed to implement an agreement which was chalked out in its presence. He said in the absence of back load, the truckers were facing losses worth 15 to 20 per cent, and since the transportation business was not yielding much revenue, they had to option but to demand their due. Mishra added that their demand was justified as the two neighbouring cement plants were also paying freight on the same analogy. He condemned the manner in which the JP management had granted the back load to other truck operators whom they were patronising in various pockets while denying these truckers this work. Condemning the role of the state government in failing to resolve the issue, Block Congress Committee president Sanjay Awasthy said it was lamentable that the truckers who had sold their land to cement companies were now forced to agitate for their rightful demands. He added that the issue should be resolved without further delay as truckers were suffering each day their trucks did not ply. Reacting to a news item appeared in these columns today, Chief Minister PK Dhumal today sought a report from the district administration in this regard. Deputy Commissioner C Palrasu said he had directed the naib tehsildar, Kasauli, to cancel the registration of the land as it was rightfully supposed to be executed at the sub-registrar’s office at Kasauli. He added that he had directed the Additional District Magistrate to enquire into the probable land cost and submit a report within three weeks. HIMUDA officials had also been directed to stop payment to sellers till the probe was completed though it was learnt that the payments had already been made. HIMUDA had already purchased about 35 bighas in the periphery of the present location near Dharampur in addition to the 45.1 bighas purchased now. Though the industries were granted this transport subsidy as per the 2003 central industrial package by the Union Ministry of Commerce at the rate of 75 per cent of the to-and-fro freight charges from the nearest railway station, but the non-release of timely funds had deprived the investors of this relief. The GM of the District Industries Centre, Nahan, GS Chauhan, said a problem had arisen after the ministry had modified some rules and the investors had failed to avail of the benefit in the absence of sufficient knowledge about the changed procedures. A committee had, however, been constituted comprising officials of the state and the union ministry to solve the issue a few months ago and the problems had been amicably settled now. The problem had arisen when the union ministry had made some changes in its procedures and had directed the investors to fulfil the new formalities with retrospective effect. The committee, however, worked out a solution to apply the modifications from “prospective” effect, thus paving the way for the release of the pending dues. Chauhan said he would distribute cheques for Rs 9 crore to the investors on January 19 during a meeting at Paonta Sahib and ensure that the investors did not have to wait any longer for the same. This subsidy would particularly benefit various lime-based units located in the trans Giri area of Sirmaur district where 65 units are operating. Both social organisations in their meetings appealed to Chief Minister PK Dhumal for immediate reorganisation of districts in the state keeping in view the manifold increase in the population and large-scale urbanisation. Addressing mediapersons, Ajit Bagla and Shanti Sarup Sharma, presidents of the two bodies, argued that in the absence of the district status, the entire Palampur region had suffered a lot in the past 10 years and failed to get Centrally sponsored projects. It lacked development as the Centre treated districts as units while sanctioning funds. They said reorganisation of the district was overdue since long as earlier this exercise was done in 1968. They added that smaller places like, Una, Hamirpur, Kullu and Solan, with a lesser area and population as compared to Palampur, had expanded fast and major development had taken place in these districts in the past few years, but the Palampur region remained the same. Besides, the infrastructure like health and road facilities was poor in the region. The two organisations appealed to leaders of the BJP and the Congress to support this move. The police has registered a case of negligence against truck driver Pratap Singh of Uttarakhand under Sections 279 and 304, IPC, at Banjar police station today. According to the police, a truck HP (66 1951), which was parked, was hit from behind by the truck (HP 65 5856) at Salvad driven by Pratap Singh. At that, Anuj, who was sitting in the truck, jumped out it, but he fell under the tyre and died on the spot. The police has booked Pratap on the complaint of driver of the second truck Mukesh Kumar of Baijnath, Kangra. The complainant had regularly been paying charges fixed by the society. He was sanctioned a loan of Rs 35,000 from the society in 2002, but the opposite party deducted Rs 3,400 and it was not refunded to him on the pretext that it was security. The complainant has paid the whole loan, but even then Rs 3,400 has not been given to him. So he filed a complaint before the Consumer Forum. According to the opposite party, the amount deducted was not security, but shares allotted to the complainant for this amount. So it could not refunded. Ranpatia has written five books, namely “Gaddi Janjatia Lok Sanskriti”, “Gujjar Janjatia Lok Sanskriti”, “Pangi”, “Himachali Itihas Avum Sanskriti Ke Ansh” and “Himachali Lok Sahitya”. Various writers and poets paid homage to the departed soul here today. Though the Kullu police lodged an FIR under Sections 457 and 380, IPC, at Banjar police station on a complaint of Krishan yesterday, no breakthrough has been made in the case. The SP, Kullu, said the efforts were on to nab the culprits. Despite the university, colleges and other educational institutions being closed for winter holidays, volunteers came forward to donate 66 units of blood. This will come as a big relief for children suffering from thalassaemia. Prof Vasudev Kuthiala donated blood for the 151st time and another teacher Madhusudan for the 104th time. The two inaugurated the blood donation camp and made their personal contribution too.